Audrey's father taught her that to stay human in the modern world, she had to build a moat around herself; a moat of books and music, philosophy and dreams. A moat that makes Audrey different from the echoes: sophisticated, emotionless machines, built to resemble humans and to work for human masters. Daniel is an echo - but he's not like the others. He feels a connection with Audrey; a feeling Daniel knows he was never designed to have, and cannot explain. And when Audrey is placed in terrible danger, he's determined to save her. ECHO BOY is a powerful story about love, loss and what makes us truly human. Echo Boy is a futuristic novel set in a world where global warming has caused drastic changes to the landscape as we know it now. Technology has come far enough that people can travel anywhere in the world in under an hour and that nearly every home has it's own echo (an android) to carry out chores. The echoes are designed to look human and come covered in real flesh, the only way to tell them apart is that they are slightly too perfect to be real. Audrey's father is strongly against the use of echoes, he believes that technology is making us lose our humanity and he worries that the echoes could pose a danger to us. He has raised Audrey to have the same beliefs but it is only after the worst possible tragedy occurs that she really starts to understand why he had so many reservations. Now Audrey is terrified, she has lost everything she ever cared about and has been forced to leave home and seek safety with her uncle but everywhere she looks there are echoes going about their daily chores. It would be bad enough if they would just say out of her sight but one echo in particular seems determined to seek her out. Daniel is an echo but he's different from the others, he has thoughts and feelings that the other echoes don't understand and can't relate to. He knows that Audrey is in danger and he wants to help her but she won't even talk to him let alone trust him to help her. Can Audrey get past her prejudice to see that Daniel is different and can they figure out what caused the terrifying events that turned Audrey's life upside down? Echo Boy is a fab read and one I thoroughly enjoyed, the future that Matt Haig has envisioned seems scarily believable and isn't one I'd want to find myself living in. This is a story about finding out who you really are, it's about finding your path in life and learning to trust your instincts. It's about love, loss, grief, hope and everything in between - what does it really mean to be human? Audrey will come to realise that sometimes the machines aren't the monsters and it's people that she needs to be wary of but she'll have to learn how to tell who deserves her trust. This is a fast paced story that will have you on the edge of your seat and leave you desperate for more. Thankfully there isn't a cliffhanger ending but I was still left wanting to know what would happen next so I was very grateful to discover there will be a sequel. YA sci-fi fans will love this one & it's definitely a book I'm going to be recommending. Ooh, I actually saw this in Waterstones this afternoon but skipped it as I wasn't sure if I'd like it or now. I may grab a copy next time I'm in, thanks! I'd definitely recommend it Jesse :o) Did you get a copy at the RH blogger party? The only thing by Haig I've read was The Radleys, which I loved. This looks really good too. Thanks for the review, Sarah! 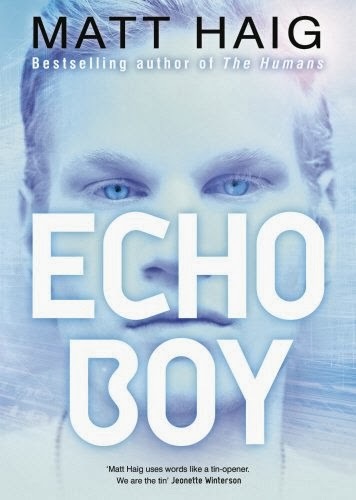 I haven't read The Radleys yet but I definitely want to read more by Matt Haig so I might start with that one next :o) I hope you enjoy Echo Boy as much as I did!